INSANE: Women Crying Sexism at NPR Can’t Recall Trump-as-Mean-Boss Stories in 2016?? MARY LOUISE KELLY: I want to bring up a Huffington Post story that’s just out. The headline is “Klobuchar’s Mistreatment Of Staff Scared Off Candidates To Manage Her Presidential Bid.” It quotes past Klobuchar staffers complaining that she was mean to them. It does also quote staffers who say she’s a great boss. So there we are. My question – and I’ll put this to you, Margaret. I don’t remember a lot of Are Men Nice Enough pieces during the run-up to the 2016 election. Is — am I just forgetting them, Margaret? Wow. Just wow. She’s saying NO ONE in the media suggested Donald Trump wasn’t nice enough? Or that no one covered Trump as a boss? Fact check! 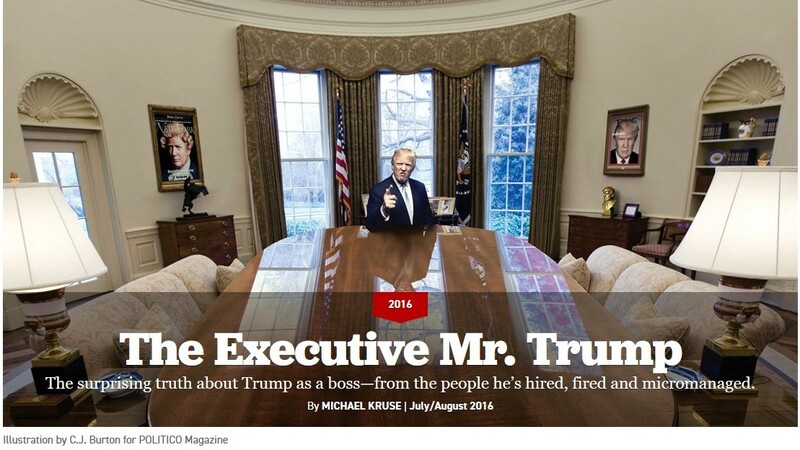 Here’s just one, NPR: “The Executive Mr. Trump,” about Trump as a boss, Politico magazine, July/August 2016. MARGARET HOOVER: Not only are you not forgetting them. I had to scratch my head even going back to my days as an operative in politics and think if I’d ever heard that line of reasoning against a male boss at all in politics. And I’d certainly heard it about women but not about men. And it is true. I mean, we know that our politics just still is laden with sexism from the coverage of Hillary Clinton to Sarah Palin to Alexandra Ocasio-Cortez and the overemphasis on the tone and the tenor and the physical appearance of women. Women don’t get a fair shake in the coverage. SUSAN GLASSER: Obviously Donald Trump was not judged in similar terms that the Huffington Post applied to Amy Klobuchar in that story, right? You know, we’re talking about someone who in the president has a toxic management style that’s beyond anything alleged at this moment for any of the Democratic presidential candidates yet that they should be judged on their own right – right? – and their own merit. What makes all this outrage especially hilarious is that NPR is complaining about Terrible Boss stories….and as we’ve just learned this year, NPR is a toxic workplace for interns, who are overworked and underpaid for years. So maybe that’s causing the hyper-sensitivity to stories questioning other liberal bosses.